• We Also Offer Weed Control ... Call or Email Us for More Information • Contact Us TODAY for an Affordable Quote! • San Diego's Trusted Pest Control Solution, Since 1981 • Welcome to Our NEW Website! COPYRIGHT © 2019 KNOTT'S PEST CONTROL. ALL RIGHTS RESERVED. Spiders (order Araneae) are air-breathing arthropods that have eight legs and chelicerae with fangs that inject venom. They are the largest order of arachnids and rank seventh in total species diversity among all other groups of organisms. Spiders are found worldwide on every continent except for Antarctica, and have become established in nearly every habitat with the exception of air and sea colonization. As of 2008, approximately 40,000 spider species, and 109 families have been recorded by taxonomists; however, there has been confusion within the scientific community as to how all these families should be classified, as evidenced by the over 20 different classifications that have been proposed since 1900. The great majority of spiders can use their fangs to inject venom into prey from venom glands in the roots of the chelicerae. Females lay up to 3,000 eggs in one or more silk egg sacs, which maintain a fairly constant humidity level. In some species the females die afterwards, but females of other species protect the sacs by attaching them to their webs, hiding them in nests, carrying them in the chelicerae or attaching them to thespinnerets and dragging them along. Baby spiders pass all their larval stages inside the egg and hatch as spiderlings, very small and sexually immature but similar in shape to adults. Some spiders care for their young, for example awolf spider's brood cling to rough bristles on the mother's back, and females of some species respond to the "begging" behaviour of their young by giving them their prey, provided it is no longer struggling, or even regurgitate food. Like other arthropods, spiders have to molt to grow as their cuticle ("skin") cannot stretch. In some species males mate with newly molted females, which are too weak to be dangerous to the males. Most spiders live for only one to two years, although some tarantulas can live in captivity for over 20 years. Spiders with medically serious bites, such as recluse spiders and widow spiders, are shy and bite only when they feel threatened, although this can easily arise by accident. Funnel web spiders' defensive tactics are aggressive and their venom, although they rarely inject much, has resulted in 13 known human deaths. On the other hand, the Brazilian wandering spider requires very little provocation. 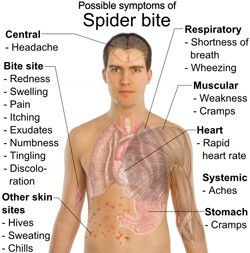 There were about 100 reliably reported deaths from spider bites in the 20th century, But pain and discomfort for an extended period of time is common. San Diego and it's surrounding areas are Spider Haven! Knott's can help you keep these pests at bay and provides and effective maintenance plan!